On this week’s episode we discuss some clouds we saw that reminded us of Sega games and we celebrate Mike and Tom’s Sega sobriety. Now, if that doesn’t sound exciting enough we also do a little Bayonetta 2 discussion, talk some Outrun and go over our main topic of product and commercial placements in video games. Oh, and you may notice the lack of a certain person named Kris this week. 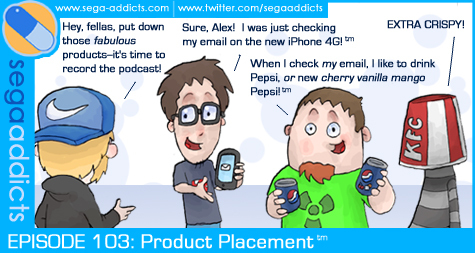 The Sega Addicts record episode 103 this week!